It was a day of amazing scenery and some of the hairiest driving we’ve done (and that is saying something after Iceland). 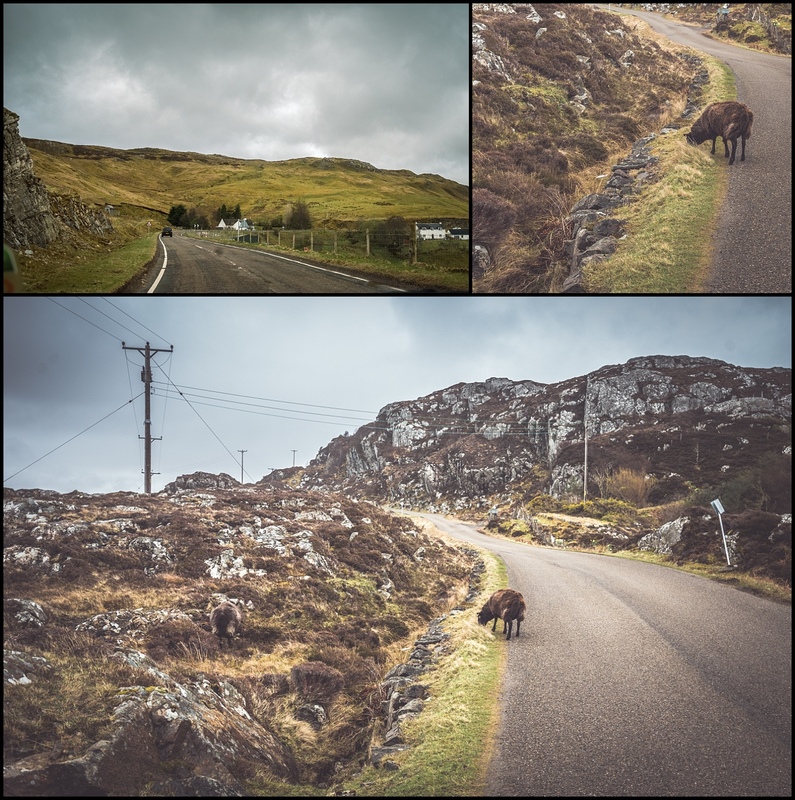 A morning of cute animals at the Lochinver croft then some spectacular scenery in the Northern Highlands through Ullapool and then the famous Bealach na Bà mountain pass to the remote Applecross peninsula, before a long and rainy drive to the Isle of Skye……..
After another long day on the road, and a late night out playing with the farm animals, we all had a good sleep in our very cute, and cozy, croft accommodation. As it gets light rather early it’s hard sleeping in, but 5 weeks into the trip we were all tired so made it until after 7am. 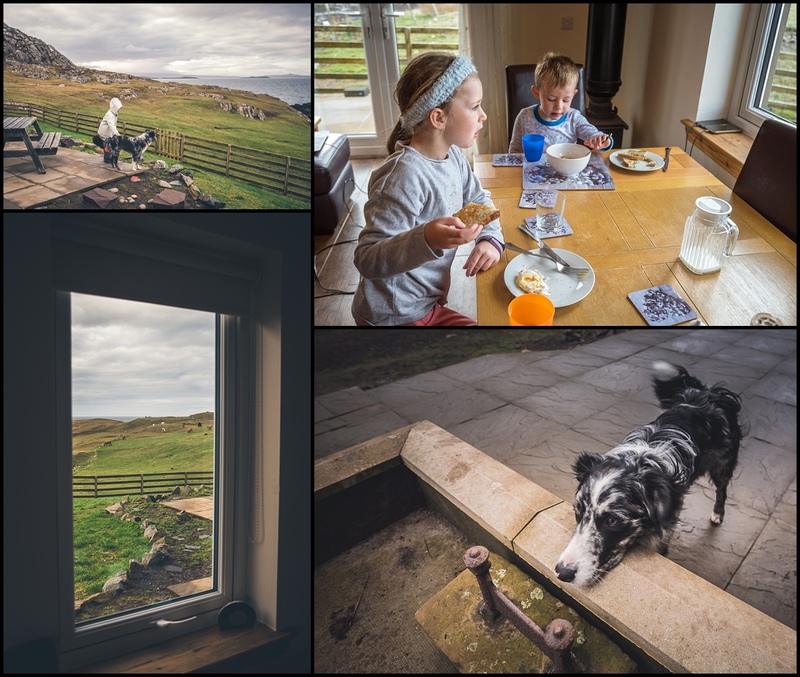 We awoke to magnificent views out of the farmhouse window and visits from the farmers dog. The kids enjoyed watching the animals frolicking during breakfast of poached eggs on toast. 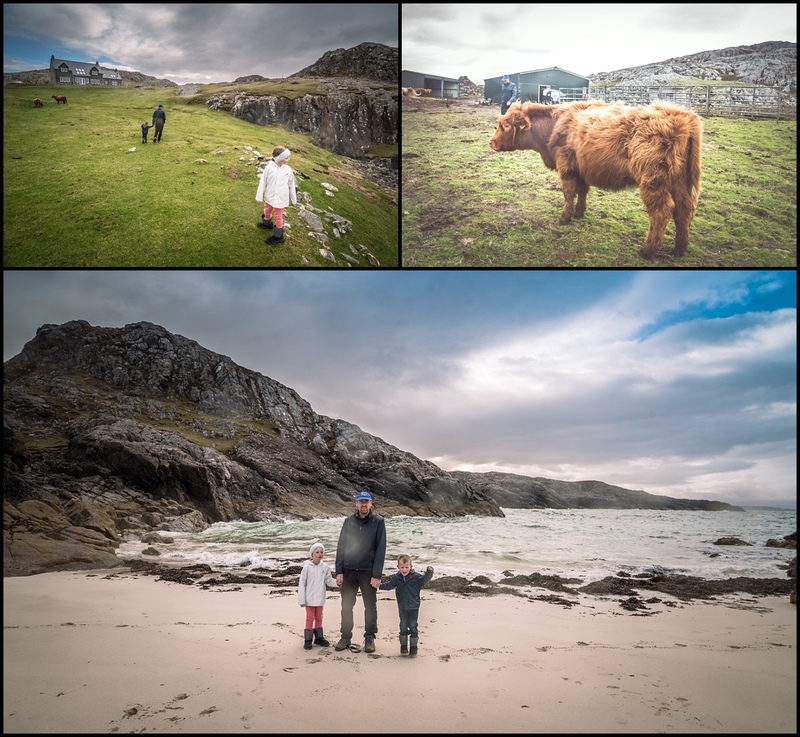 Our Airbnb host had let us know that we were welcome to help with the animals being fed in the morning, so we all got dressed quickly and headed out into the cold to watch the pigs being fed and check out what the Highland cattle had been up to overnight. 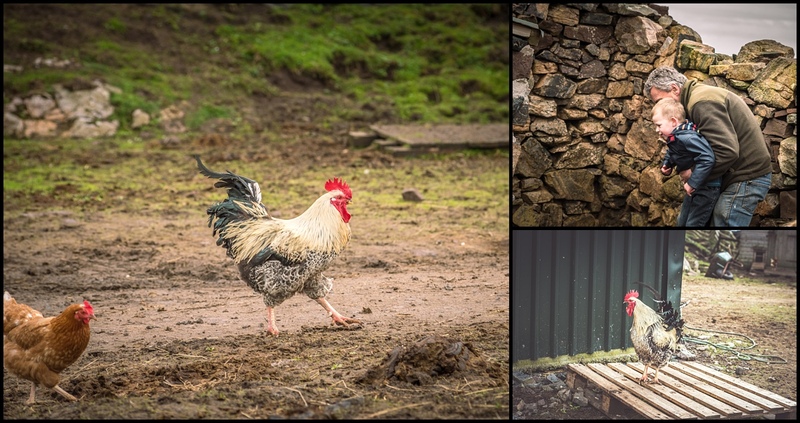 The amazing scenery and cute animals dotted all over the farm kept us amused for a bit, my camera might have gotten a bit of a work-out! We wished we were staying longer. It seemed like a much better idea to hang out here in the farm-house and playing with the animals than spending most of the day in the car! 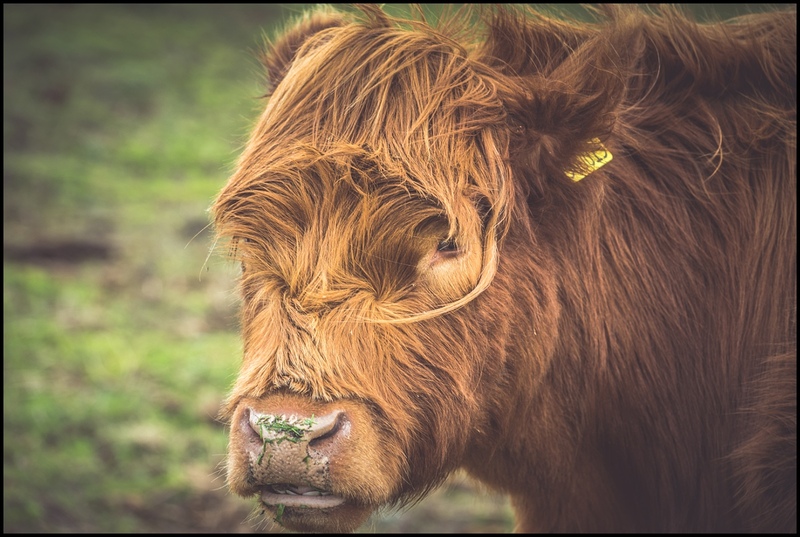 It was pretty cold and trying to rain, the hairy coo did not seem at all fussed, and were happy enough to let us talk to them. 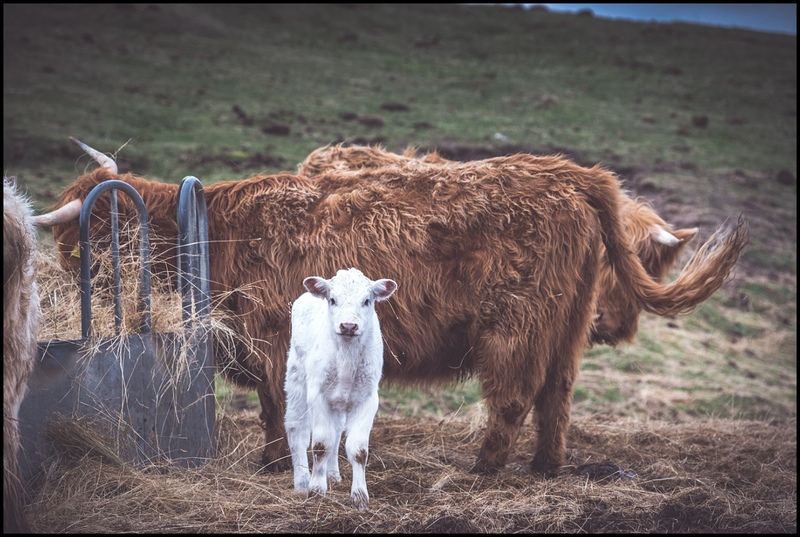 Although we were trying to keep our distance from the mum’s with new calves (who were much more wary of us). Graham, our host farmer, took the kids to see the baby pigs in the very muddy sty and showed us more of the calves on the farm. Cuteness overload! 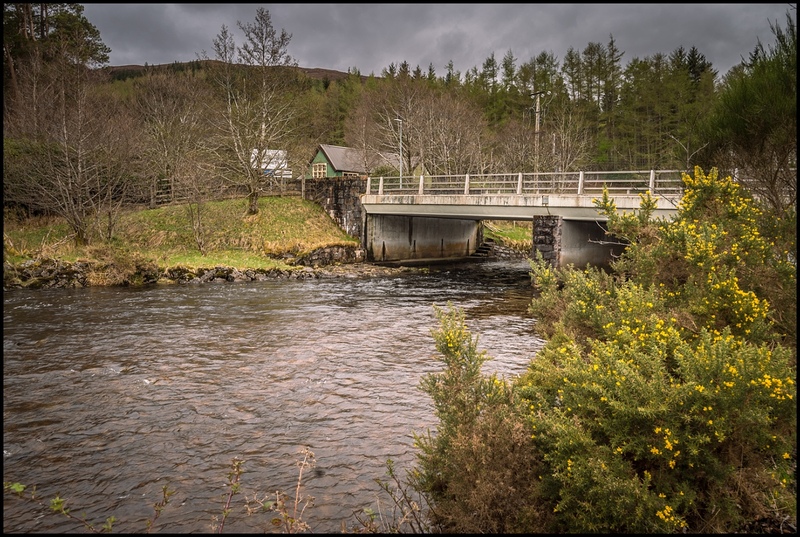 There looked to be some very nice scenic walks in the area so if we hadn’t had accommodation booked for the night on the Isle of Skye we would have been staying longer. We’ll just have to come back one day! 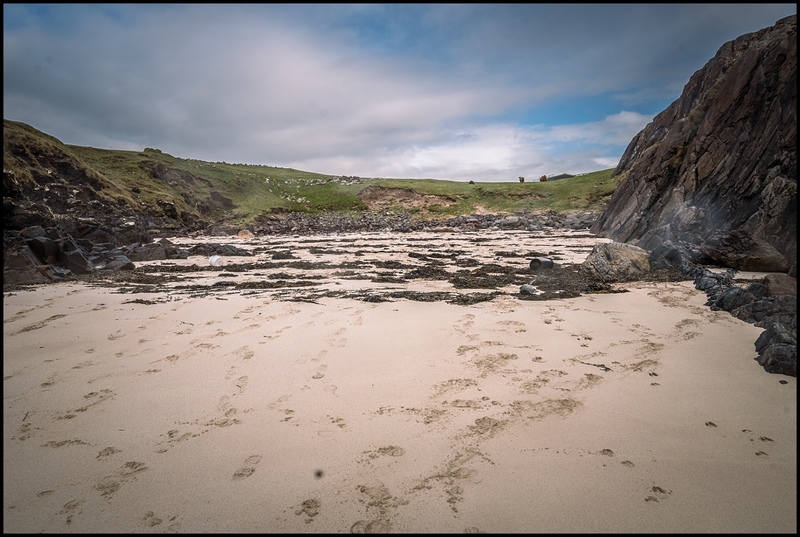 Now all thoroughly muddy and rather cold, we finally extracted the kids, got the car packed and reluctantly departed just before 10am. The driving for the day, taking us along the north-west coast of Scotland up to the Isle of Skye was to be around 5.5 hours, plus some stops. Unfortunately with roads that are single lane, it means a lot of stopping to let oncoming traffic pass and it generally takes longer. 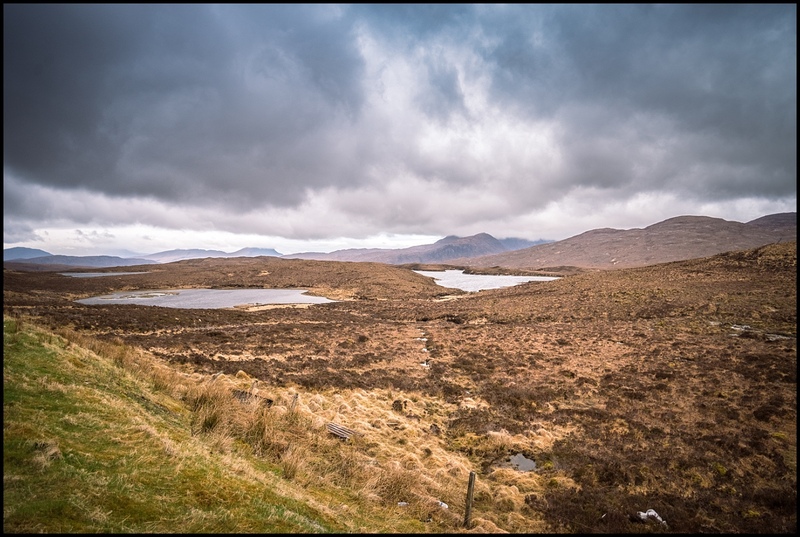 We also didn’t allow for the slowness of going over the Bealach na Bà in appalling conditions. It turned out to be a long (but scenic) day in the car. 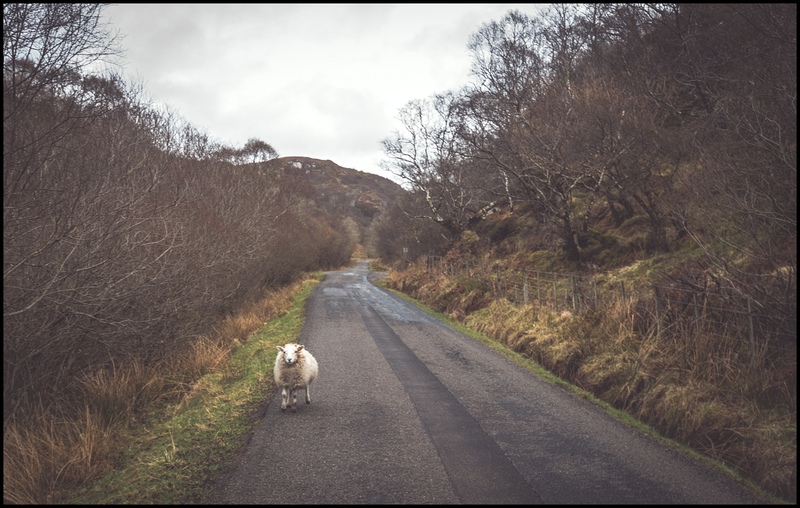 As we left Lochinver, we had to stop several times for lazy sheep on the road. I had to exit the car more than once to give them a good shooing to let us pass. The first bit of driving was down the same bit of winding road as our entrance to Lochinver the previous afternoon. It was just as scenic in the opposite direction although the intermittent driving rain made it more difficult to take photos. We were constantly coming across Ferraris, out for a rather scenic and speedy drive. We must have seen about 20 which was more than a coincidence! 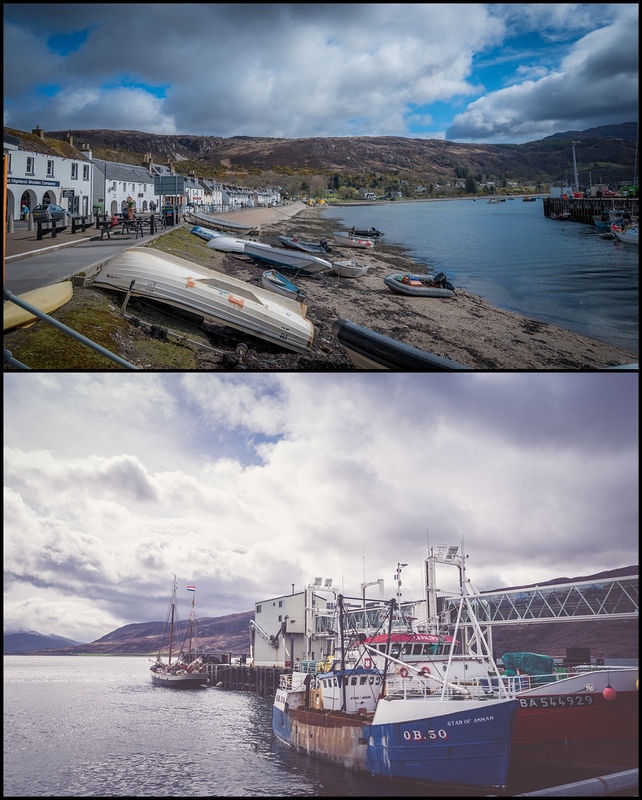 We arrived in Ullapool, just under an hour from leaving Lochinver. 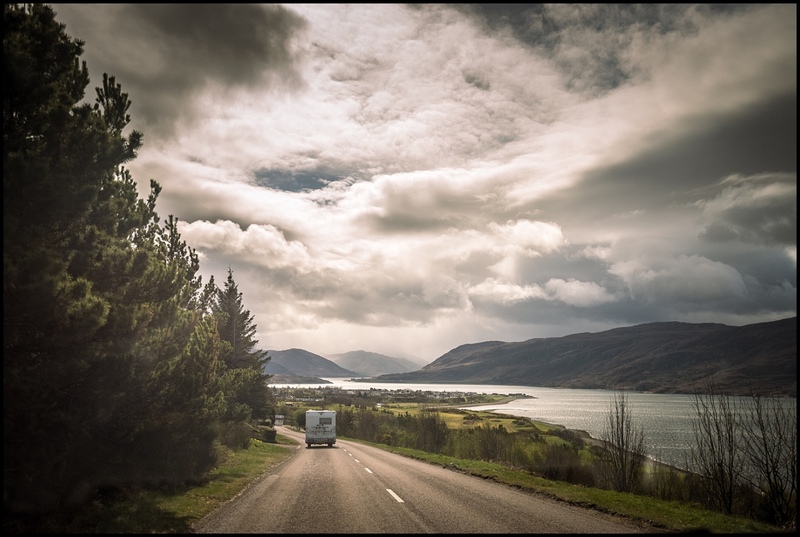 Ullapool is a town of approximately 1500 and the biggest settlement for some distance within the Highlands. 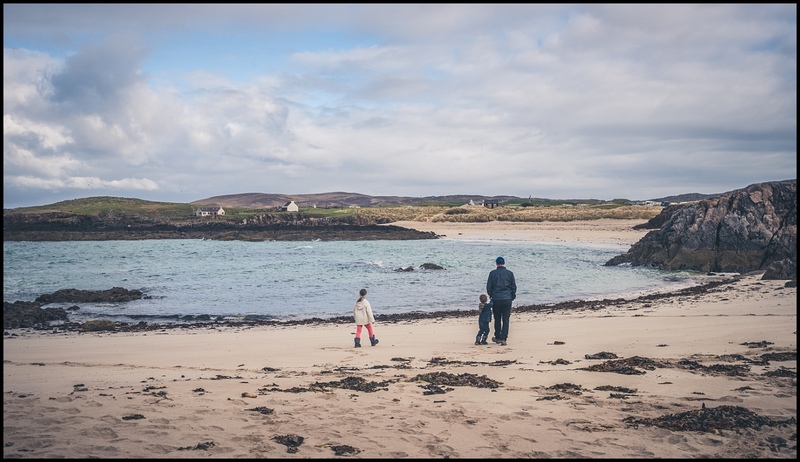 It is both a popular tourist destination and a port town and runs a ferry service to the Outer Hebrides islands (which regrettably we weren’t going to get time to visit on this trip). We were all in need of a toilet break, leg stretch, and some morning tea, so found a park for the car and had a wander through town and down by the harbour. 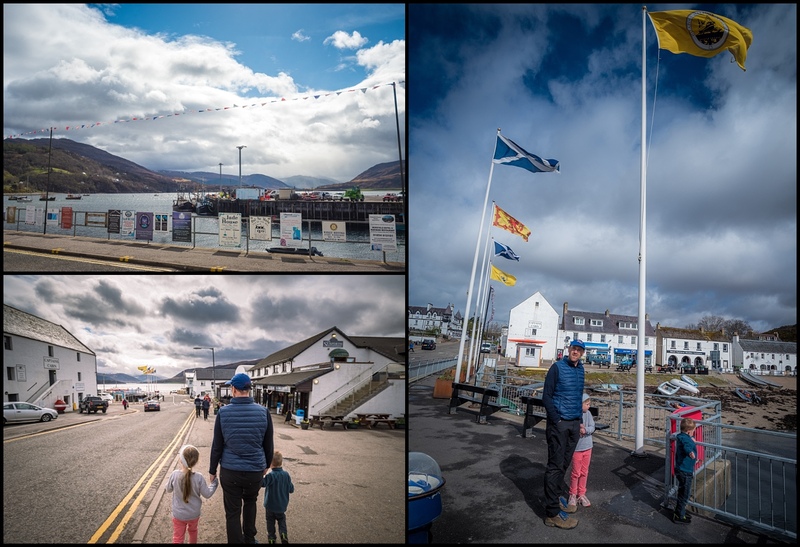 Ullapool is very pretty and we enjoyed our walk along the harbour but then the kids voted for morning tea of coffee, hot chocolates, and a lovely lemon and orange cake, and a boiled dark fruit cake, while watching the boats on the harbour. Our visit to Ullapool was rounded out with some souvenir shopping at one of nearby shops where some biscuits and wool products were purchased. 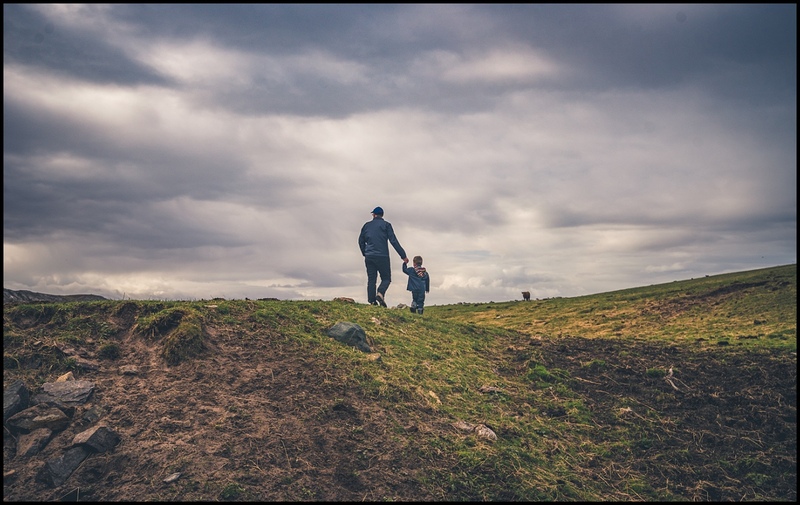 Astrid was having tantrums over cake and hot chocolate so when we returned to the car we suggested the kids rested on our next section of driving. We gave the kids the newly purchased tartan blanket and this induced sleep pretty quickly. 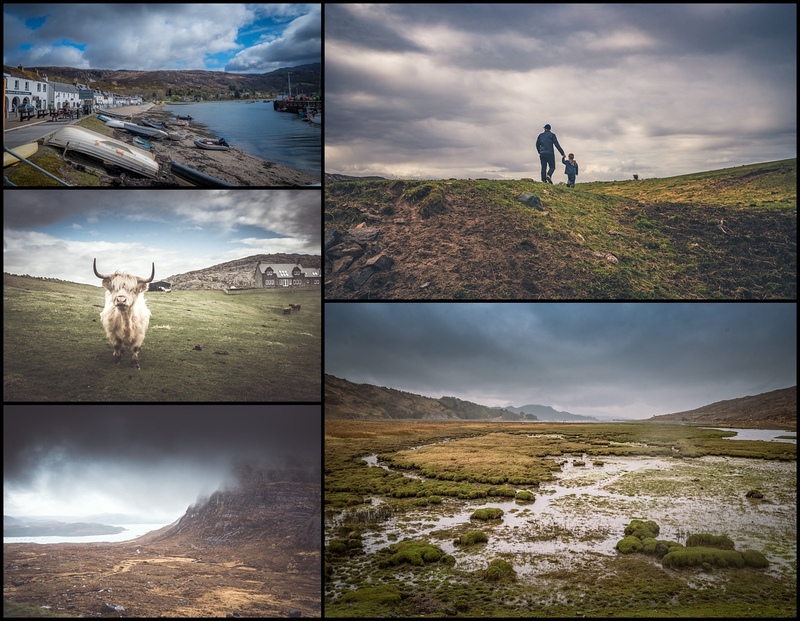 The views back along towards Ullapool were quite pretty, but the kids happily snoozed through it all! The next section of driving was again rather scenic. It was raining again intermittently and quite foggy but we did manage to see a reasonable amount of the passing scenery. 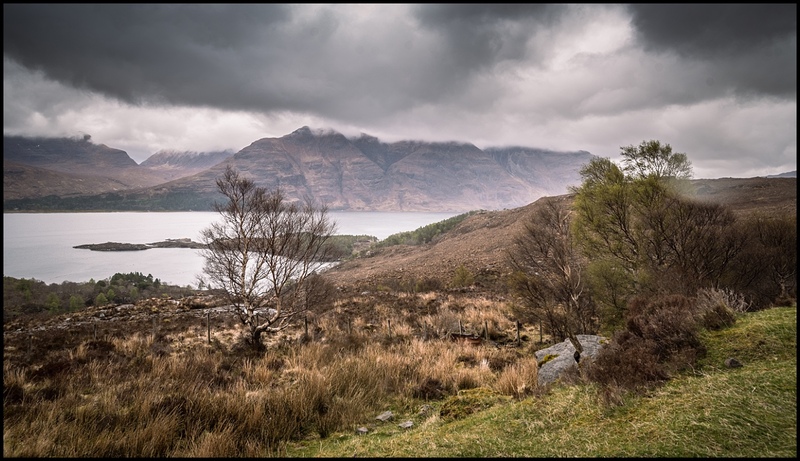 We passed several rivers full with snow run-off and made a quick stop at Loch Torridon for photos. 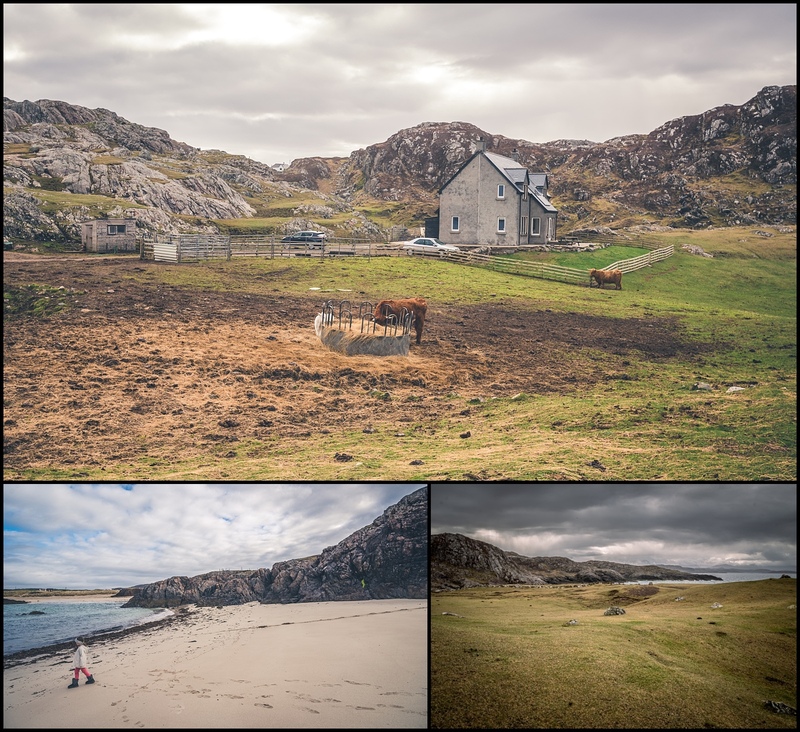 Our next planned stop was Applecross, a remote peninsula in the Wester Ross area of the Highlands. 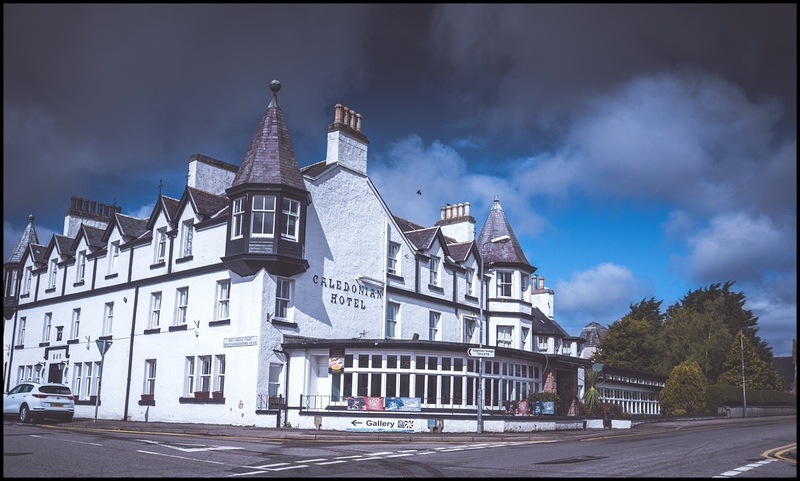 We planned to arrive in Applecross for a for late lunch at the famous Applecross Inn. 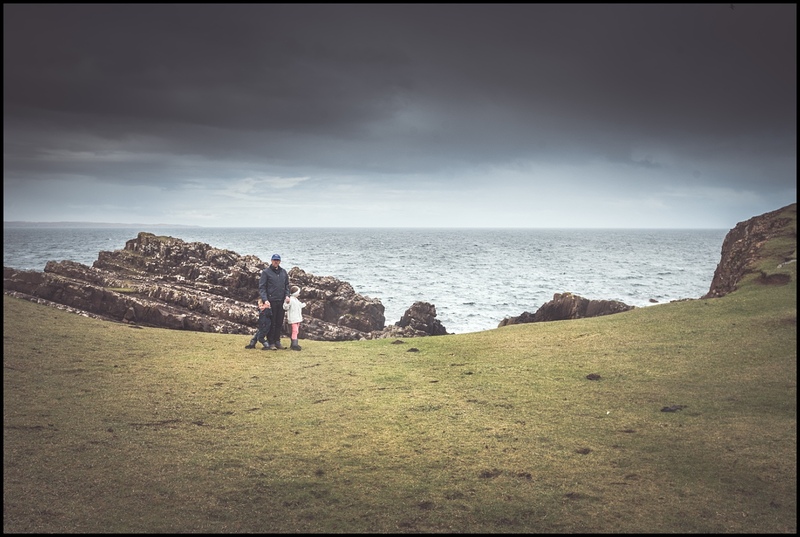 Applecross is known for its beauty and giving the impression that you are at the ‘edge of the world’, probably because of its inaccessibility. 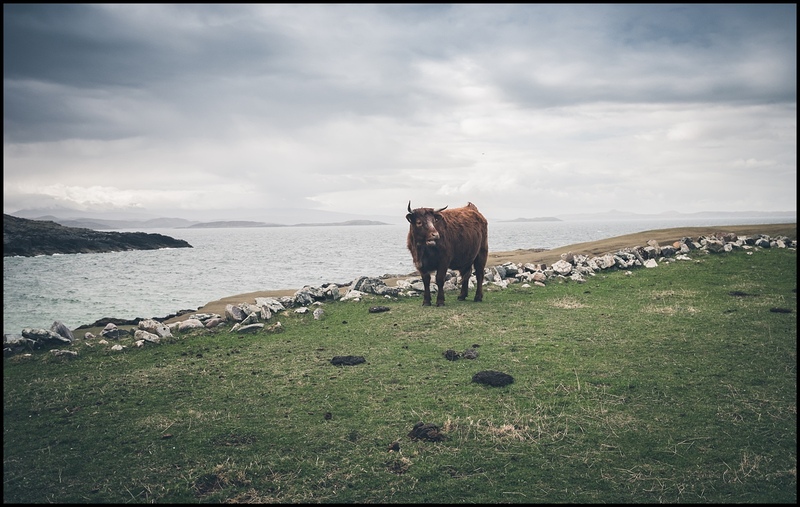 There are two ways of getting to Applecross: a winding coast road from Shielding, to the north on Loch Torridon, with reportedly great views all the way; and the Bealach na Ba (Pass of the Cattle). 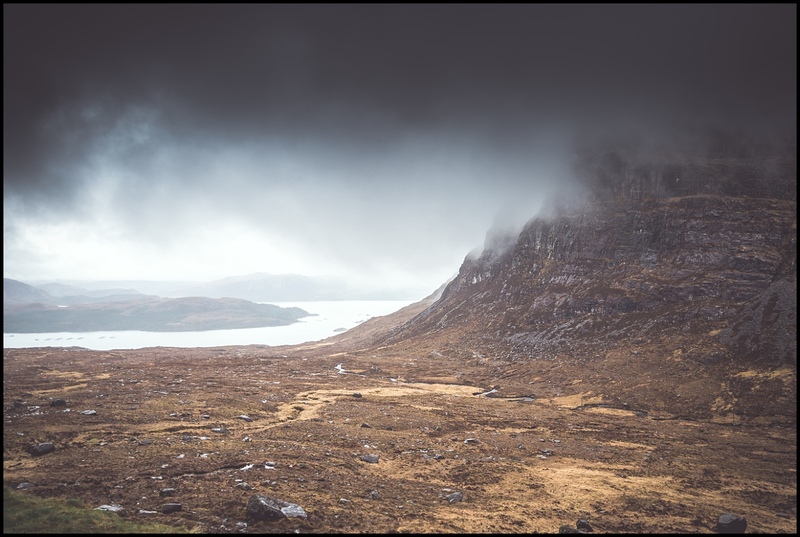 Bealach na Bà is a winding single track road through the mountains of the Applecross peninsula and has the steepest ascent of any road climb in the UK. 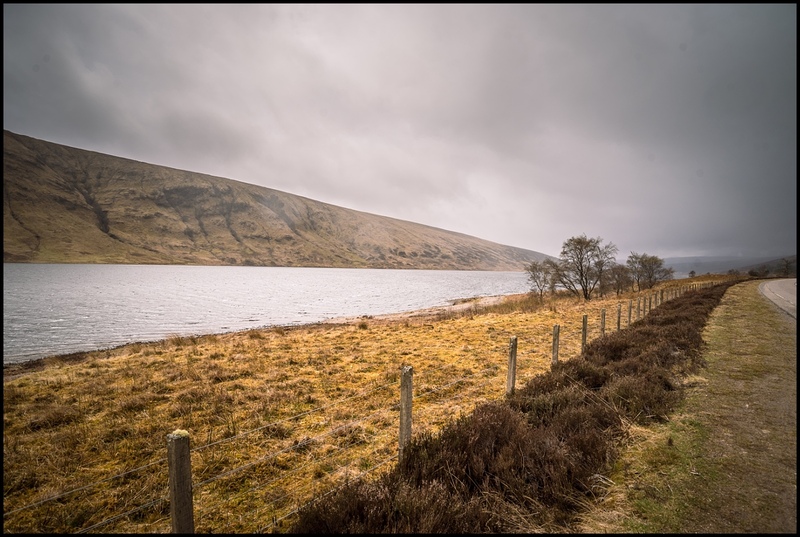 The road is one of the highest in Britain, reaching 2,053 ft (626m) above sea level and features some delightful 20% gradients and is the third highest road in Scotland. We pretty quickly realised why the road is closed in Winter. There are no guard rails for most sections of the road and the entire road is single (narrow lane) with frequent passing places perched out onto the side of the mountain with sheer drops below. The historic mountain pass was built in 1822 and is engineered similarly to roads through the great mountain passes in the Alps, with very tight hairpin bends that switch back and forth up the hillside. You quickly head into the clouds on Alpine hairpin bends and there was no shortage of traffic meaning frequent stops to let cars pass from the other direction and often 3 (or 5 or 7) point turns in passing places. We were all thankful for the small(ish) rental car and that we were not in a motor home. At the top of the mountain it was 4 degrees, incredibly foggy and there was still snow on the ground. 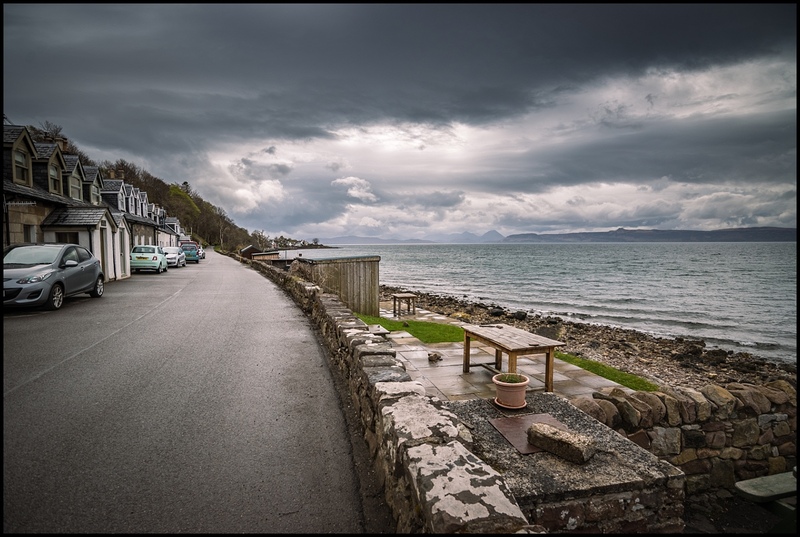 When we were all feeling very over it we quickly dropped down into Applecross from where you can see out across the bay to Raasay and Skye. Well you can when it’s not foggy and rainy! 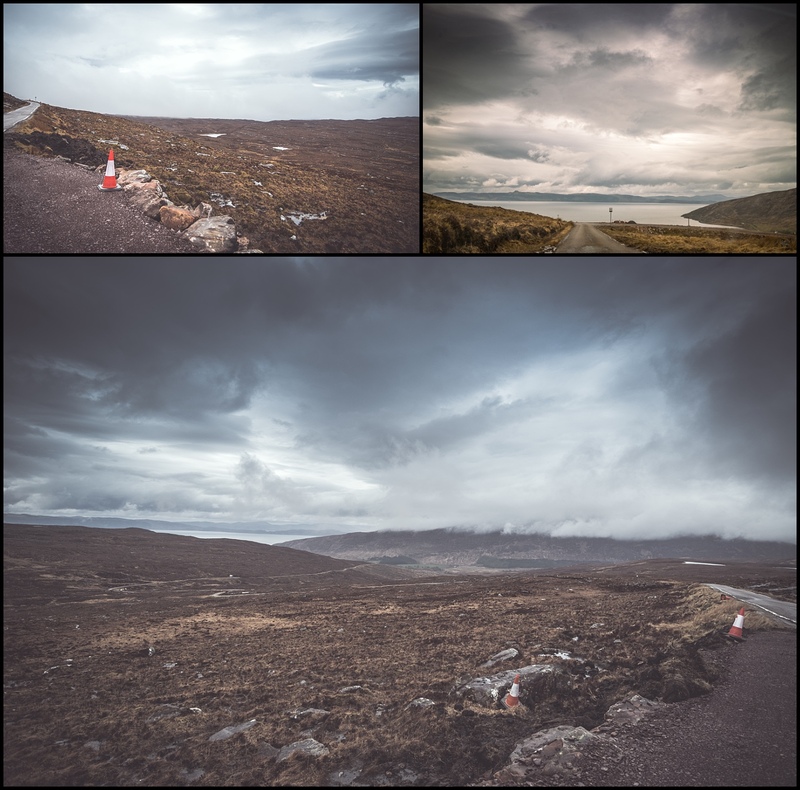 We were all very relieved when we reached Applecross at 3pm – much later than planned as the drive over the Bealach na Bà was incredibly slow and rather nausea-inducing. 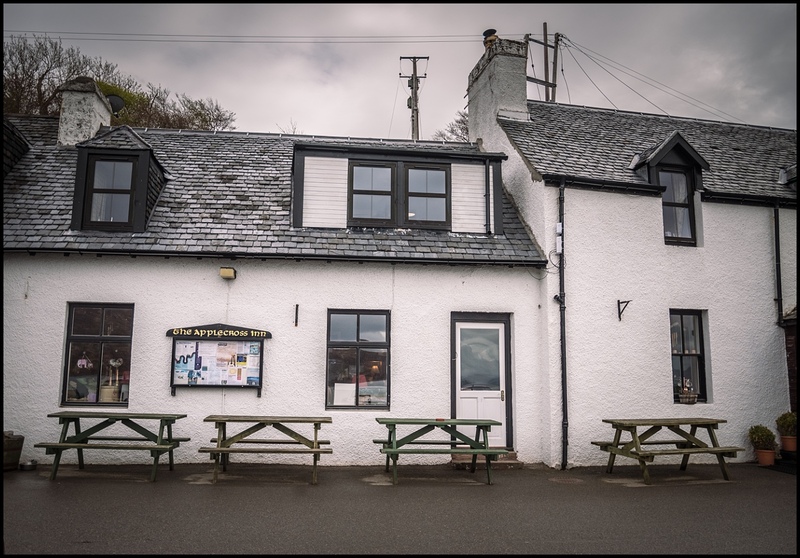 The Applecross Inn was busy despite the hour, and the difficulty of even getting to Applecross (there were limited food options I guess). Soren ordered some haddock, chips and beans, Astrid chicken nuggets, corn and chips. I had a veggie burger and Anto also went for haddock and chips. I think the fish was the winner on this occasion. 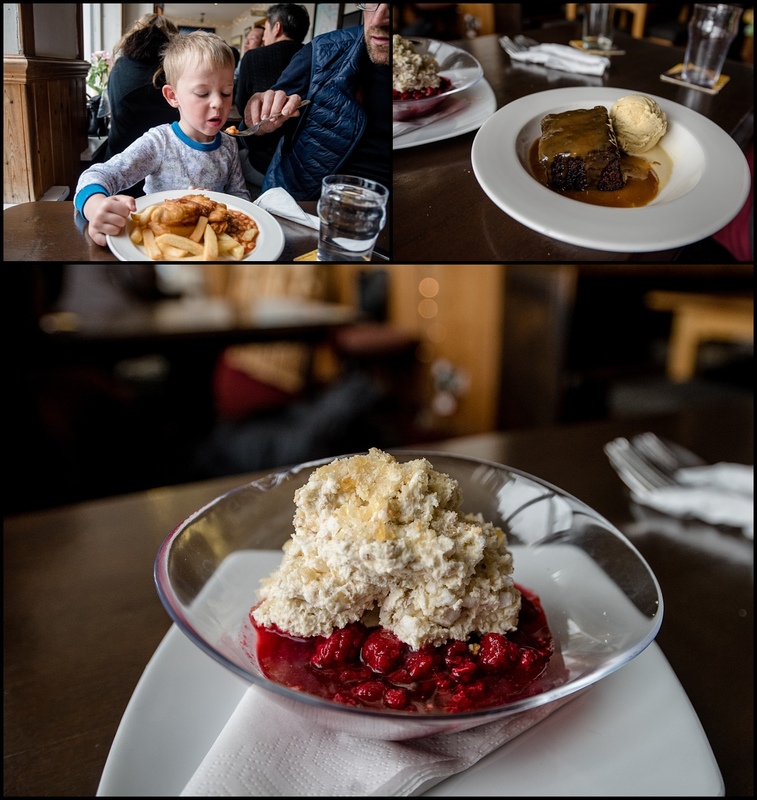 We figured we also owed ourselves dessert after the terrifying drive so tucked into a sticky date pudding and raspberry cranachan for dessert. We were all very full but figured it would be a late dinner by the time we got to Skye, little did we know how late! With full tummies we went for a little wander through the tiny town of Applecross to stretch our legs. It was now raining quite hard and it was getting colder and foggier by the second. At around 4.10pm we figured we’d better get moving, as there was another 1.5 hours driving (according to Google maps) to our accommodation in Skye. We were planning on driving back out the other route to Shielding, not wanting to go over the mountain pass again. 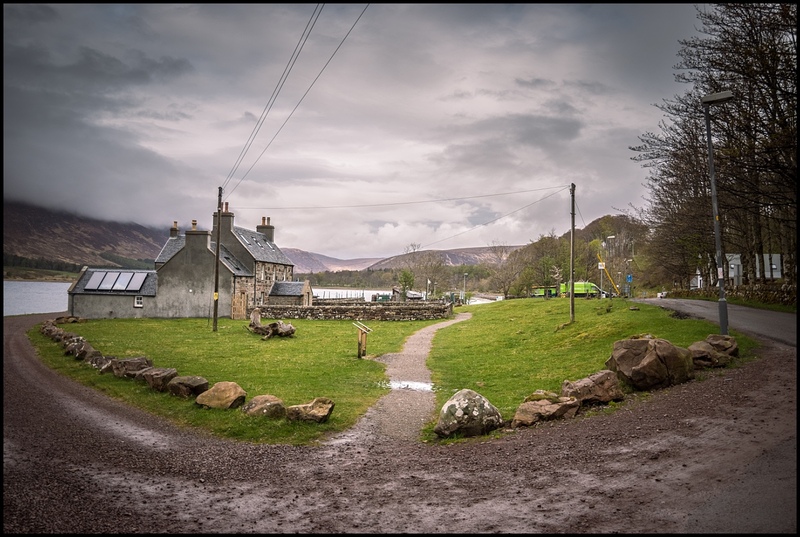 Of course there was no phone coverage in Applecross but we’d uploaded offline maps the night before and had the car GPS. 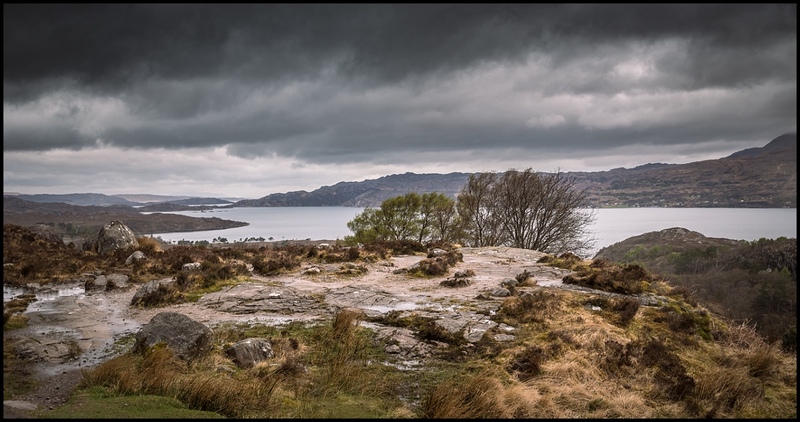 Unfortunately the car GPS was now telling us the drive to Skye was going to be 95 miles and 2 hours 40 taking us back over the Bealach na Bà. 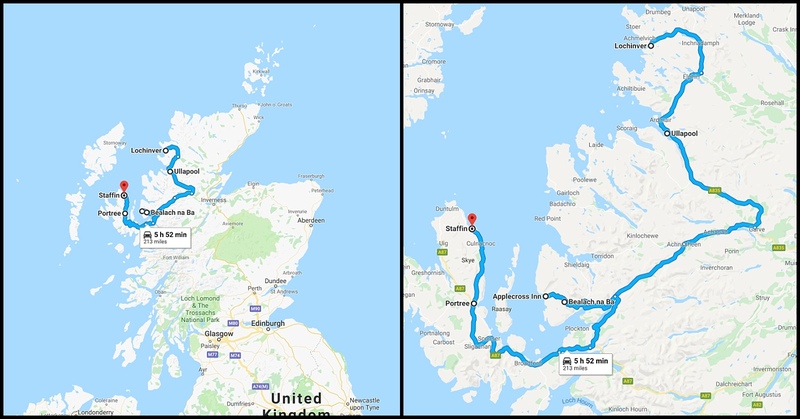 We desperately hoped this was a horrible mistake and tried a couple of different roads out to see if we could get it to recalculate and take us the other way, but we had no luck so given the late hour we didn’t want to waste any more time so decided to just get on with it and head back up the Bealach na Bà. None of us wanted to go back over, least of all Anto who found it a difficult drive. Even the kids were pretty much in tears at the thought! It was now 3 degrees and so foggy it we were down to barely 2m visibility. Given the scary drive up this was not reassuring, but we at least had some idea of what turns and switchbacks were approaching. 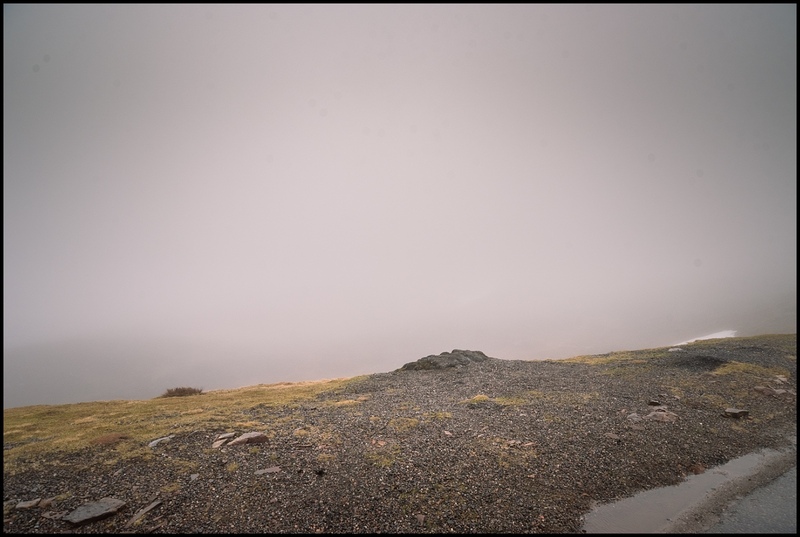 We did have to go even slower with the reduced visibility but we couldn’t see the big drop-off so it was in some ways less terrifying! Kudos to the guys operating the diggers perched precariously all up and down the side of the mountains (presumably trying to widen the road). We also had to cheer on many cyclists riding the road up. Not a ride I’d sign up for a in a hurry! Finally we reached the bottom, without incident, all pleased to be down. A very scenic drive and an experience but we all agreed that once in an afternoon would have been enough. 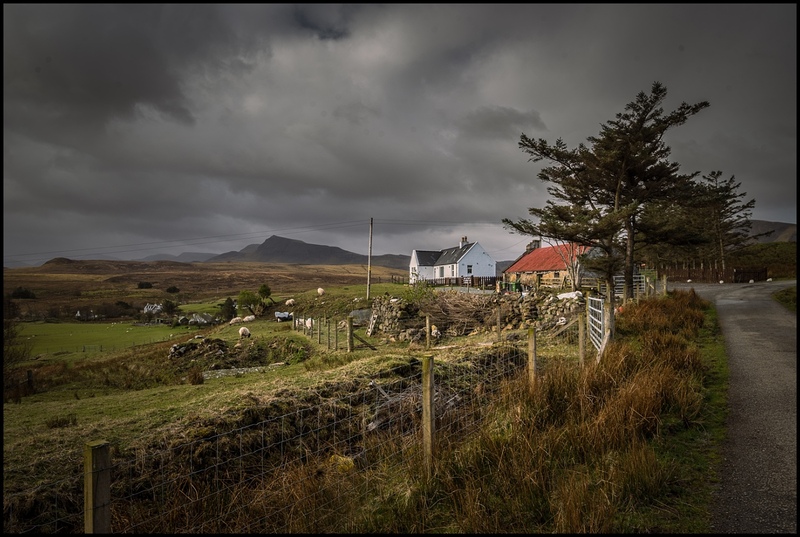 Given the late hour we decided we needed to find a supermarket on the way to Skye, as they would all be closed by the time we reached our accommodation. 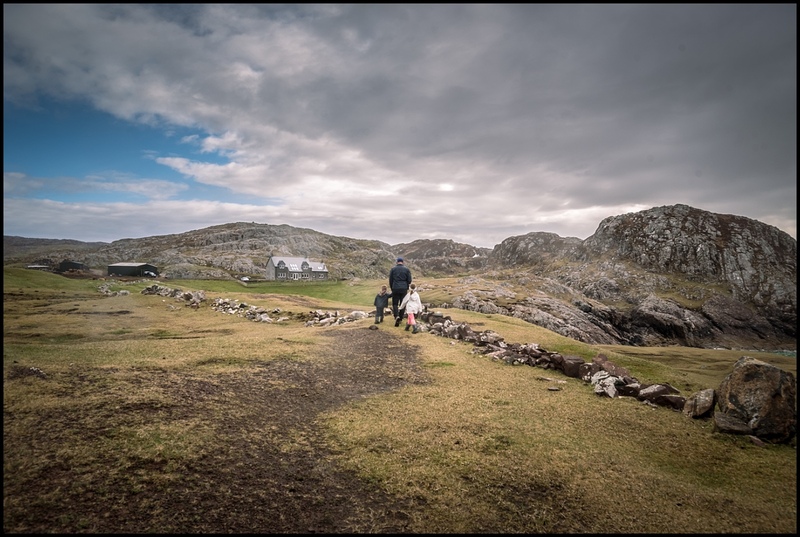 We found a tiny supermarket open in a town not far from the Bealach na Bà and purchased a few things for dinner and breakfast, from not a lot of options. Fruit and veggies weren’t particularly great up in this area. We still had about 2 hours of driving to go, and we were all tired and not keen! The kids were being pretty good given the long day we’d had. 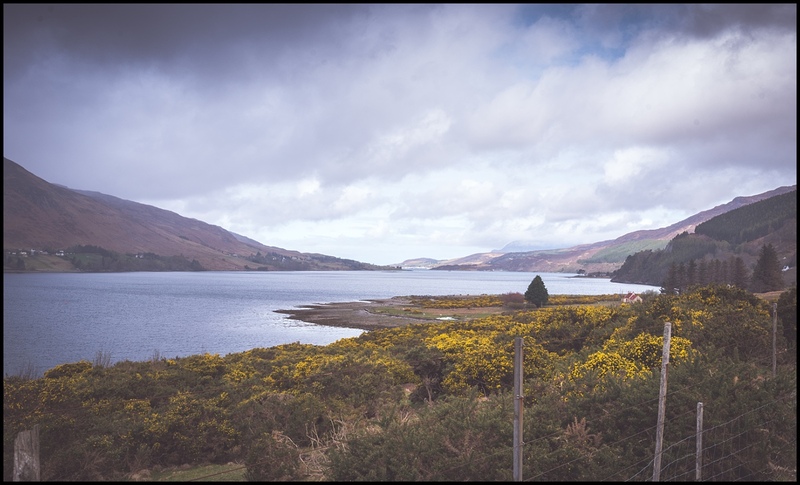 We were driving some spectacular country along the north of Scotland, with a lot of the landscape similar to our drive through the fjords in Iceland. Unfortunately we didn’t take many photos as it was hard to see in the rain and mist. The kids had been excited to get to Skye bridge. Once we arrived at the Skye bridge they were all a bit underwhelmed, it was big but not that exciting (we weren’t sure what they were expecting). 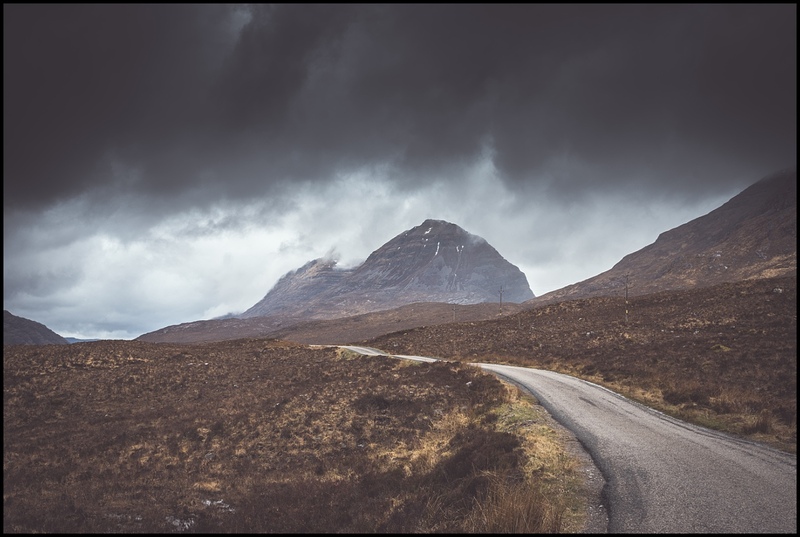 If we thought the weather had been bad on the way to Skye, it was worse on Skye. We could barely even see the road with driving rain, let alone any of the passing scenery. 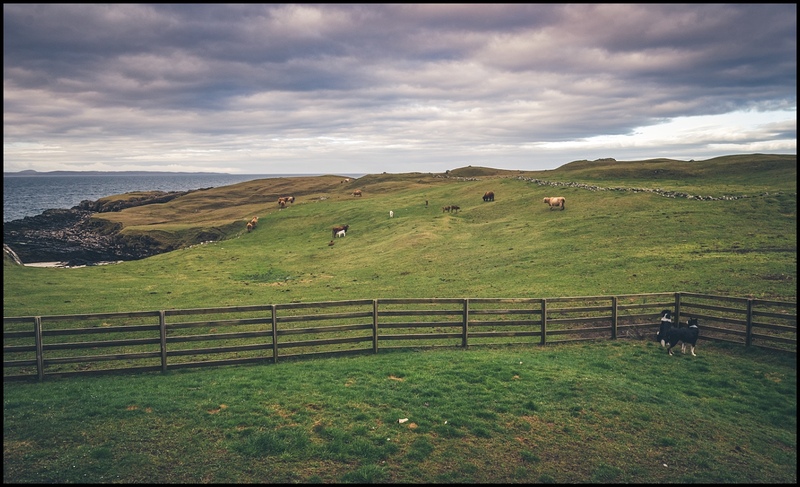 We had 50 miles of driving to go to get to Staffin (in the North of Skye), where our accommodation was located. The kids napped on and off for a bit, which was lucky given the late hour. 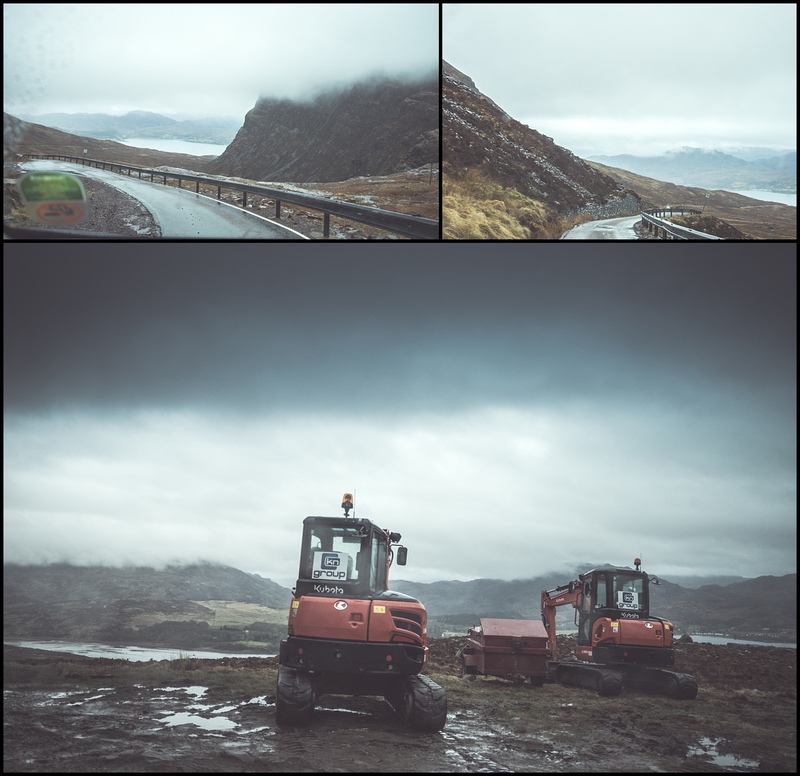 The roads weren’t bad up to Skye’s main town of Portree. 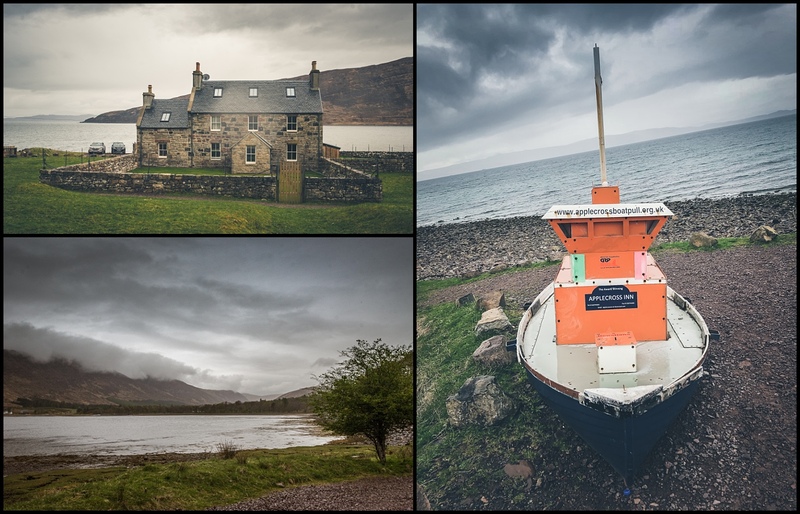 The rain had eased a little and Portree looked very pretty, but it was already 7pm so we didn’t stop. Luckily we were coming back this way when leaving Skye and were hoping the weather would be better then. Unfortunately after Portree the road conditions deteriorated (as did the weather). 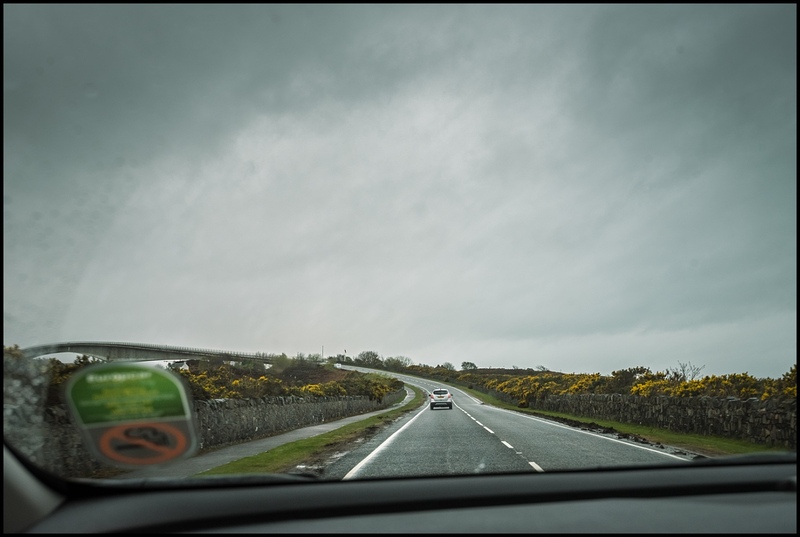 We were back to single lane winding roads and driving rain. 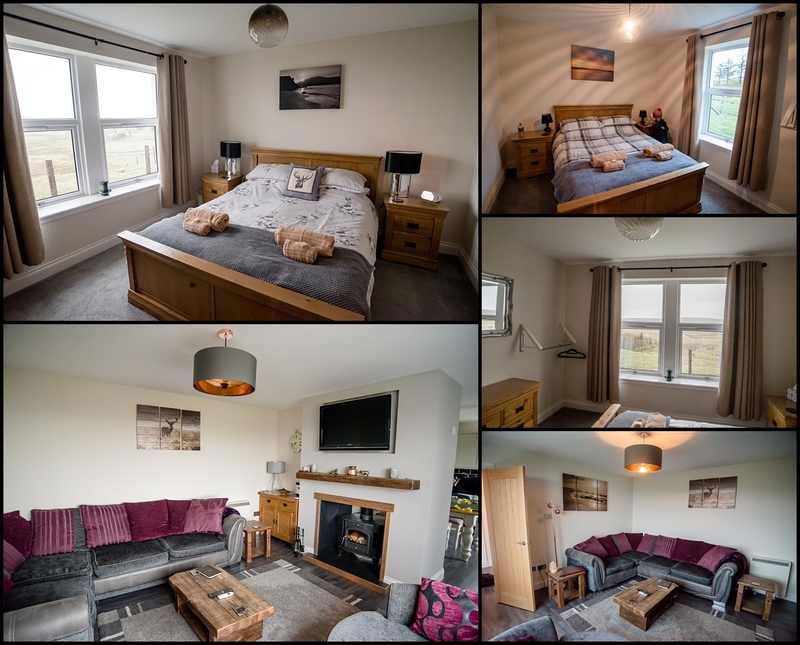 We finally made it to our very cute Airbnb at 7.40pm, a beautiful cottage called Seasound, not far from Staffin. We were all exhausted and glad to be out of the car, the cottage had wonderful views and was huge, we were in heaven! We figured if the weather was cruddy again the next day, then we could just relax in the cottage by the fire, looking at the views, which wouldn’t be so awful. Anto managed to get a fire going to warm us all up, and we made up a cheese and dip snack plate for a late dinner before bundling up the kids for showers and bed and the adults taking advantage of the couch, fire and British TV after a long but scenic day. 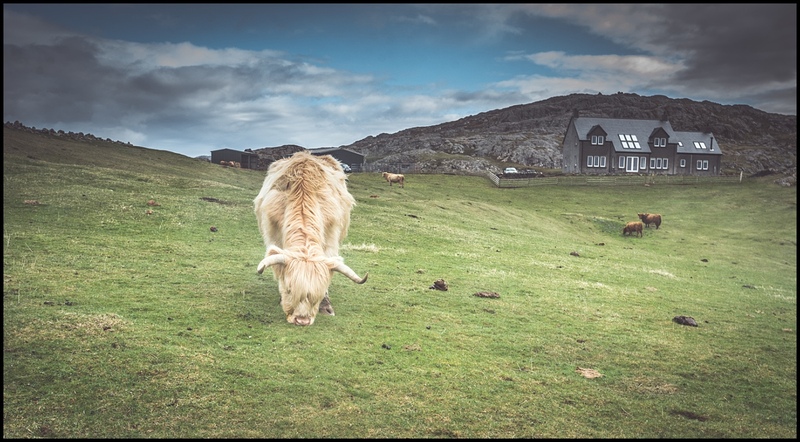 Daily statistics for Monday the 23rd of April 2018 in the Scottish Highlands and the Isle of Skye – the temperature started out at a mild but windy and rainy 7 degrees in Lochinver. 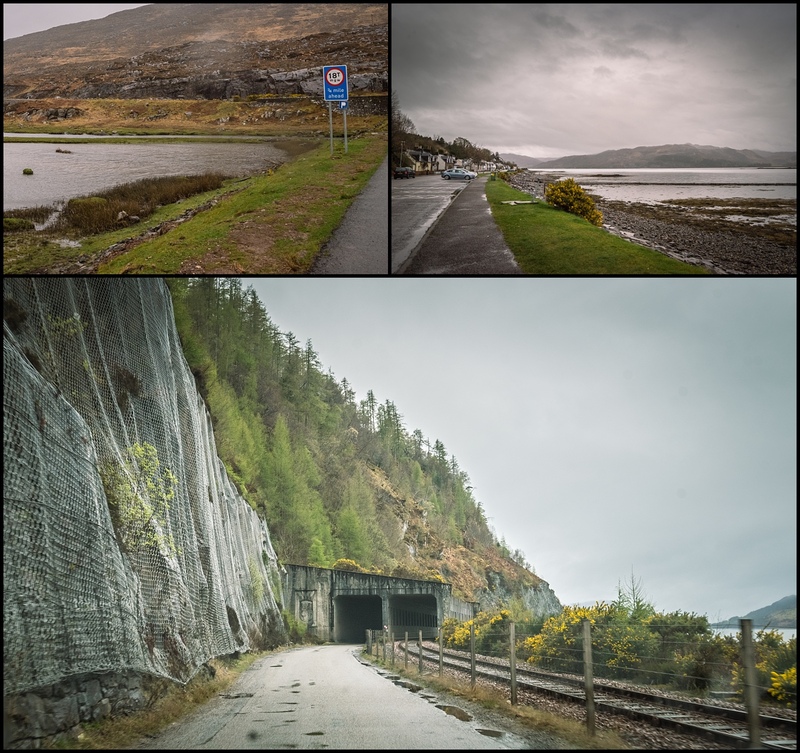 Ullapool was a more pleasant 11 degrees and as we went over the Bealach na Bà road, the temperature dropped to 3 degrees with rain and fog. It was a little warmer down in Applecross at 9 degrees. 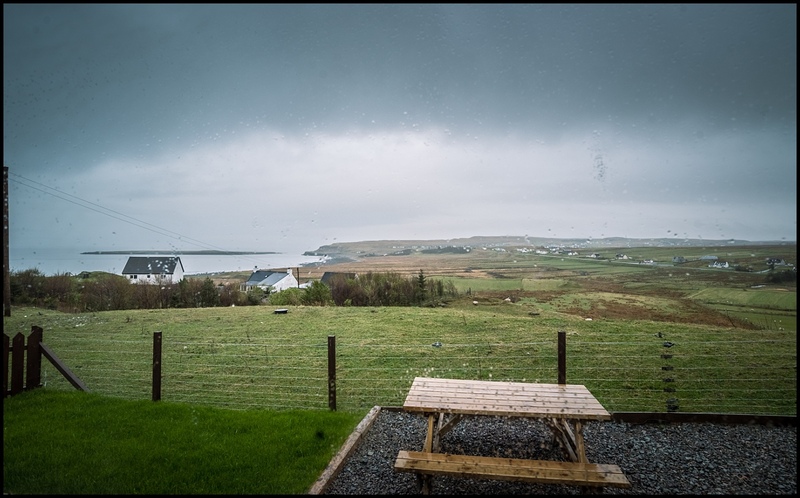 The drive up to Skye brought us plenty of rain and it was a cool seven degrees and raining overnight in Staffin. 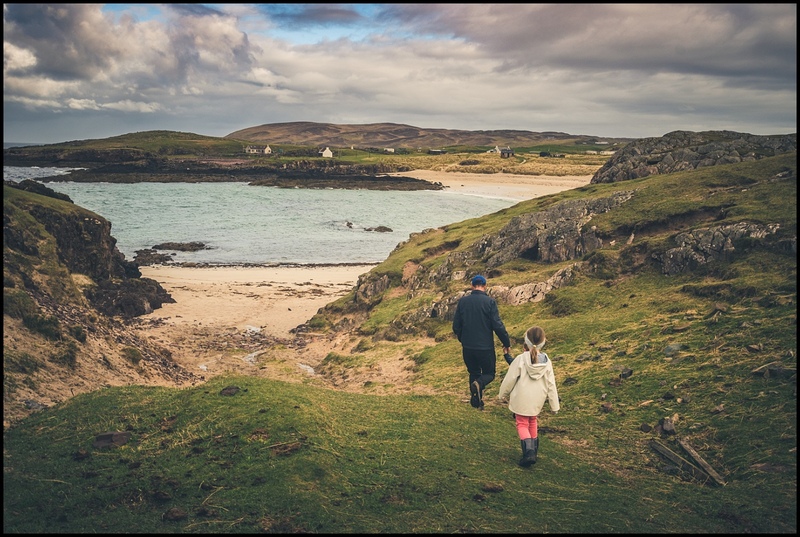 Up next, a day exploring Skye with some amazing scenery – searching for dinosaur prints on the beach, hiking the famous Quiraing, visiting the magical Fairy Glen and Kilt Rock. 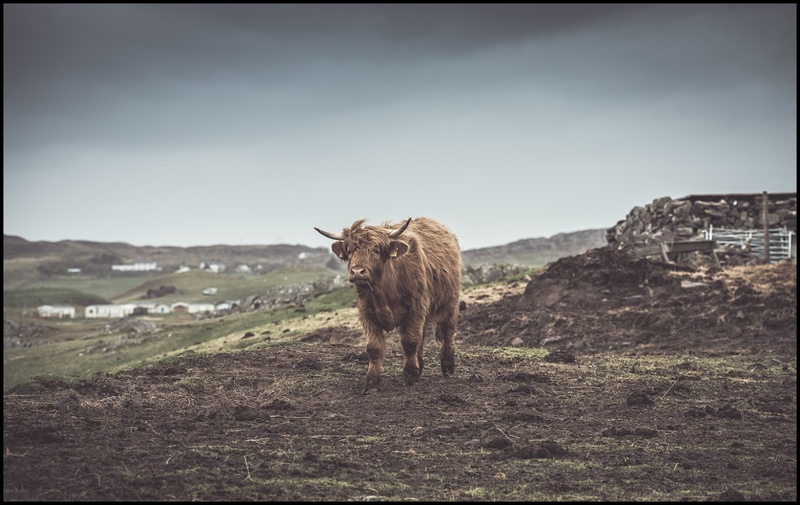 Posted in 4 years, 6 years, Anto, Applecross, Astrid, Bealach na Bà, HIghland Cow, Highlands, Isle of Skye, kids, Lochinver, Scotland, Scottish HIghlands, Soren, Staffin, Travel, travelling with kids, UK, UllapoolBookmark the permalink.